Travel | Wat’s the story? It is difficult to blame visitors for such a perception as tour guides themselves have played a part in creating such a stereotype. In some of the tours which I have taken part in, many of these guides go no further than describing some aspects of design and architecture, providing some narratives of the mural paintings on the walls and some brief explanation on the origin of the Buddha image with its special features. Tour guides may not be aware of this, but by limiting the Wat to just these features may prevent visitors to go further, exploring beyond the walls of the temple. When stories of the Wat are disconnected from communal and other elements that surround it, visitors lose the opportunity to discover more. Who was the artist who drew the murals? Where else can I view his work? How does the symbiosis play out between the resident monks and the village communities? Is there any where one can see how the architecture and design of the viharn (prayer hall) is constructed, such as the roof and door panels? 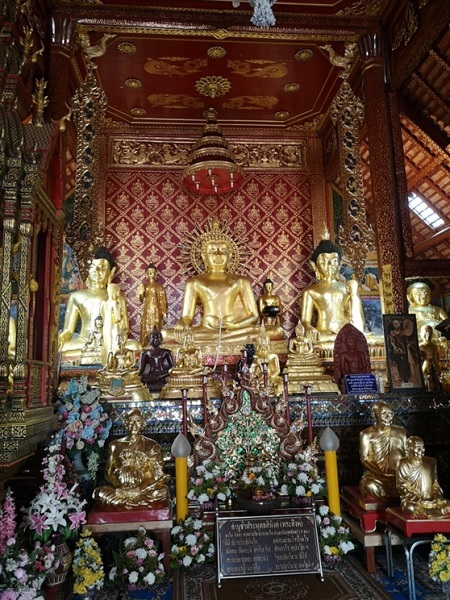 To illustrate the theme described above, I will use an expansive narrative of the humble Wat Phra Singh, one of the oldest and most revered temple in Chiang Rai. This narration will demonstrate how by connecting elements found within the temple to local culture, the arts, festivals, Buddhist teachings and the communities surrounding it, we will also discover the heart and soul of Chiang Rai. The story of this revered Wat begins simple enough. It is old, built in 1385 CE which is a little over a century after the city of Chiang Rai was founded by King Mengrai in 1262 CE. King Mengrai was the first king of Lanna (1292–1311 CE). Lanna (Lan Na or Lannathai) was an Indianized state located in present day Northern Thailand. The Lanna kingdom lasted from the 13th to 18th centuries. During its heydays, Lanna covered territories stretching from parts of Southern Myanmar (current day Kengtung and Mong Nai), most of Northern Thai provinces (with exception of Phrae, Phayao and Nan provinces), Chiang Hung in southern China (modern Jinghong in Yunnan), areas of modern Northern Vietnam, principally in the Black and Red river valleys and most of Northern Laos. Chiang Rai has a special affinity with King Mengrai because the city was named after him. If you happen to pass by Chiang Rai town centre, you can see the statue of King Mengrai prominently situated in a busy junction. A tourist information office sits behind the monument, where you can read up on the history a little more. 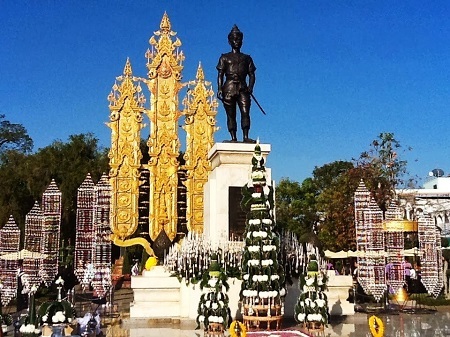 From January 26 - February 4 every year, a 10-day event called Wai Sa Phaya Mengrai (King Mengrai Festival) is held to commemorate and to pay homage to the city's founding father. Nevertheless, the cultural development of the Northern Thai people had begun long before successive kingdoms that preceded Lanna. The distinctive culture, architecture, the arts and people of Lanna within the northern regional sits proudly with its own identity, compared to the contemporary Sukhotai style for which most people in the world associates Thailand with. The so called "Lanna style" house - also called Ruen Ka-lae is constructed entirely from teak wood. The structure is elevated from the ground on many teak columns to prevent it from flooding during rainy season, which also provides accommodation below for use during dry season for activities such as weaving or other handicrafts. Another feature is the two hand-carved 'V-shaped' sloping roofs which add structural support using "A" frame principles. Lanna Thai architecture designs are both traditional and accommodate local factors such as the climate and naturally available materials to form a structure that can resist the rains, yet remain cool in the hot and dry season. Lanna style is synonymous with Wat Phra Singh's architecture. 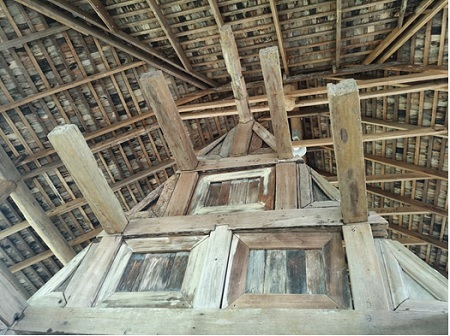 Made entirely of teak, the roof of the viharn (main hall) is typical Lanna traditional structure. 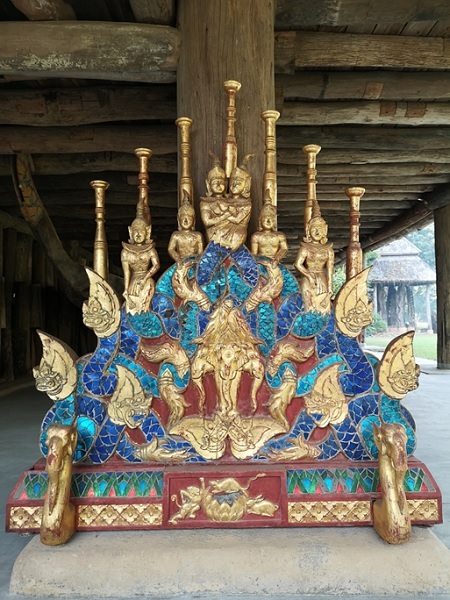 If one wishes to see the structural framework of the roof of a Lanna style wat, such as how the beams connect with one another without the use of nails, a life size exhibit called "Vihara Structure" can be viewed at the Mae Fah Luang Arts and Cultural Park. In Chiang Rai, it common to see many features of a house deriving from the Lanna people’s spiritual and animist beliefs, which enables them to live in harmony with their spiritual neighbors. Wooden carvings on the doors of Wat Phra Singh’s viharn. It is no different with Wat Phra Singh, in particular where a set of beautiful, elaborately carved teak doors adorn the main entrance of the viharn. 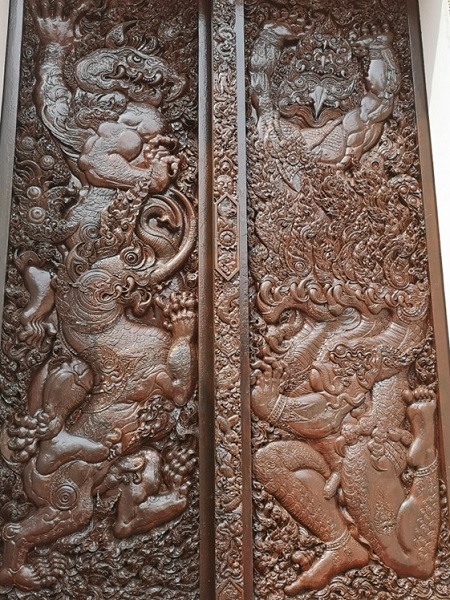 These doors were designed by the late Thawan Duchanee (1939-2014), a renowned, world class artist who is also a local Chiang Rai resident. The door carvings reveal deep, sophisticated Buddhist philosophy related to the four fundamental elements of the human body. These four symbolic representation are: earth (depicted by an elephant), water (naga or dragon), wind (garuda, or phoenix like bird) and fire (singha or lion). Thawan Duchanee's contribution to Wat Phra Singh is significant because first time visitors who have not heard of him may be interested with his great masterpiece, which is Baan Dam or the Black House, located not far away from Wat Phra Singh. Part art studio, part museum, part home, Baan Dam is an eclectic mix of traditional northern Thai buildings interspersed with some outlandish modern designs. 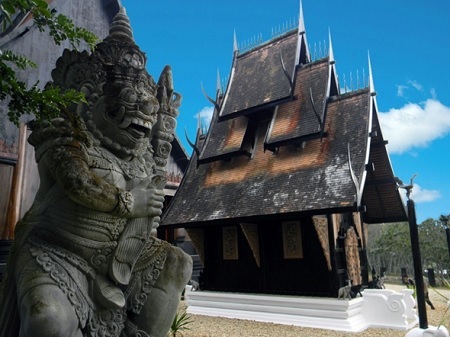 For aspiring and serious art buff, it is one of the "must visit" site of Chiang Rai. One of Thailand’s most revered Buddha images was once enshrined inside this wat. The image, named Phra Singh or Phra Sihing Buddha with the Bhumisparsha pose (earth touching gesture) is believed to have originated from Sri Lanka. 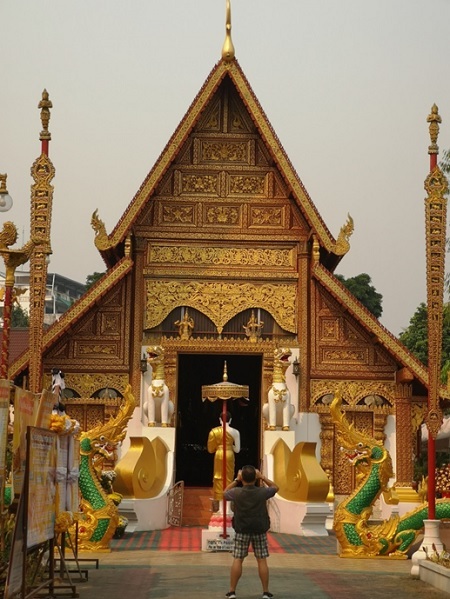 The temple contains several copies of the Phra Singh image, including an ebony and gold, and a purple jade image. The original is now in the Wat Phra Singh temple in Chiang Mai. Khmer, Sukhothai, India, Burma and Sri Lanka. Typically, the Buddha images feature a lotus bud or orb shaped finial and large hair curls. The torso is plump but with a slim waist line. The face is round and smiling, with high curving highbrows, a hooked nose and mostly narrow lips. A clear distinction between Lanna style and Sukhothai style is the missing flame which appears on top of the head of the Buddha, which personifies Thai Buddhism. There are notable accessories on the altar of Wat Phra Singh which are unique to Lanna culture and are still used by the monastic community here. These include offering trays (for flowers, robes etc), Buddhist manuscript chests, palm leaf manuscript box, offering bowls, wooden dtung (ceremonial banners) and the candelabras. Those wishing to know more about these accessories can view them more closely at the Wat Phra Keaw museum, which also houses the famous jade Buddha. An eye opener for first timers is the beautiful candelabras (which mostly holds seven candles) which for some western visitors resemble the Jewish Hanukah. The candelabras are prominently displayed at the annual Candle Festival (Hae Thian in Thai), which is held around the days of Asanha Bucha, which commemorates the Buddha's first sermon and Wan Khao Phansa, the beginning of the rains retreats, where monks do not go out for alms until the rainy season is over. Wat Phra Singh may be a humble, royal temple. Visitors often give it a miss as the more famous Wat Phra Kaew draws more footfalls. 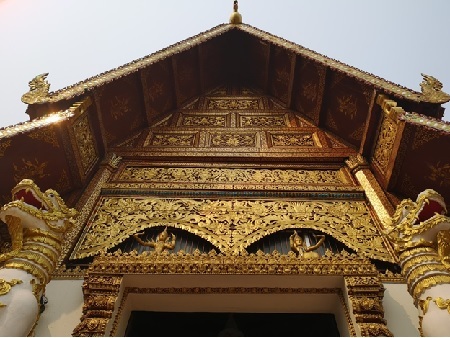 Nevertheless, a skilled story teller who is able to weave the Lanna story through its walls, roofs and doors will help visitors to not only appreciate its beauty but to also touch the soul of Chiang Rai. Through this humble wat, great personalities (such as Thawan Duchanee) are waiting to be discovered and magnificent artifacts waiting to be explored at Mae Fah Luang and Wat Phra Keaw. From the likes of Thawan Duchanee, visitors are drawn into a local boy's great artistic mind and philosophy displayed at his Baan Dam (Black House), thereby immersing oneself deeply into Chiang Rai's revered arts and craftsmanship. Skillfully packaged, Wat Phra Singh can be the starting point of what makes Buddhist tourism tick for Chiang Rai. The question is this: the money is lying around on the table, but are the authorities game enough to pick them up and kick start what could be the next tourist gem for Thailand? Wat Phra Kaew on Trairat Road is one of the most renowned temples of Chiang Rai as it was where the sacred Emerald Buddha had been enshrined since 1444 before it’s been relocated to Wat Phra Kaeo in Bangkok. Wat Phra Kaeo now enshrines an official replica of the Emerald Buddha made of green jade. The temple also houses a 700-year bronze statue of Phra Chao Lan Thong in the Chiang Saen style ubosot you hardly can find elsewhere. Right at the center of Chiang Rai city finds the monument of King Mengrai, the great king who founded Lanna Thai kingdom. King Mengrai was originally the ruler of Nakhon Hiran Ngoen Yang, an ancient town off in Chiang Saen. With a will to establish a great kingdom for the people of Lanna, he advanced his power to nearby kingdoms (Chiang Rai was one of them) until he successfully established the Lanna Thai kingdom in 1296 with his power centered at Chiang Mai. This museum is worthy of visit as it contains exhibits of Lanna history. There are many ancient items inside such as ‘Oub Kham’, a golden-coated bamboo food bowl used by kings and senior monks only. The museum is located about 3.1 kilometres away from Wat Phra Singh. Mae Fah Luang Art & Cultural Park houses the region's largest collection of folk art and teak artifacts from the Lanna Kingdom. It has been recognized as a unique tourist destination in northern Thailand and has won the Thailand Tourism Award 2006 as an outstanding tourism destination in the category of Arts and Culture. It is situated some 18 kilometres away from Wat Phra Singh. Baan Dam is the architectural masterpiece and residence of the late Thawan Duchanee. In Thai, 'baan' means home or house and 'dam' means black. The Black House isn't just one structure, but a collection of around 40 buildings of varying shapes and sizes dotted around a peaceful garden. The grounds include nearly 40 small black houses made of wood, glass, concrete, bricks, or terracotta in various unique styles and design scattered around the temple area. The cluster of houses accommodates Thawan's collections of paintings, sculptures, animal bones, skins, horns and silver and gold items from around the world. It is just 11 kilometres away from Wat Phra Singh. Asalha Puja or Asanha Bucha in Thai is a Theravada Buddhist festival which typically takes place in January, on the full moon of the month of Āsādha. Also known as Dhamma Day, is one of Theravada Buddhism's most important festivals, celebrating as it does the Buddha's first sermon in which he set out to his first five disciples the doctrine that had come to him following His Enlightenment. Khao Phansa Day is a Buddhist holiday observed in Thailand on the first day following the full moon occurring in the eighth month of the Thai lunar calendar. Another name for Khao Phansa is “the Rains Retreat” because it occurs at the beginning of Thai rainy season. 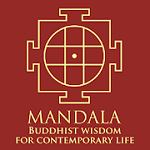 Buddhist monks take this opportunity to retreat inside their temples for a three-month period of study and meditation. Lim Kooi Fong is a Malaysian Buddhist writer and founder of Buddhistravel.com. He is also founder and managing editor of BuddhistChannel.tv, a dedicated web-based Buddhist news portal. He is the co-author of the UNWTO project for the South East Asian section on "Buddhist Tourism in Asia: Prospects and Sustainability" (to be published in July 2019). Contact him at editor@buddhistchannel.tv. Lim is based in Kuala Lumpur, Malaysia. Jaffee Yee is a media, art and travel marketing consultant and a veteran award-winning publisher. Jaffee Yee is currently the Publisher and Editor-in-Chief of “NiHao” 你好, a premier Chinese magazine on high end travel for Thailand and the Greater Mekong Subregion, published by Knowledge Media Group Thailand. He is also the Chairman of PATA Chiang Rai chapter - https://www.pata.org/chapters/pata-chiang-rai-chapter/ and https://www.facebook.com/PATACR/. Jaffee is a long time resident of Chiang Rai, Thailand. 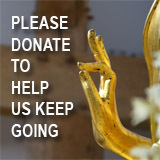 Both Lim and Jaffee are strong advocates for the development of Buddhist Tourism, particularly in South East Asia.